Normally, I am one of those teachers least likely to be quoting the state’s Ed Code, unless, of course, my old colleague and I were complaining to our principal at my old school about another teacher, who used to leave her students running amok on the recess playground without credentialed adult supervision. But given that this was a new school year, I had to admit that I wanted, and needed, a fresh start to go with it. 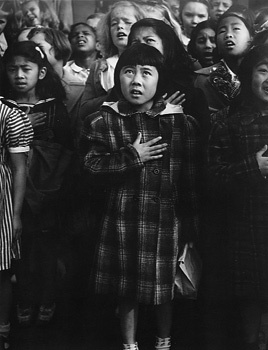 An iconic Dorothea Lange image, and my favorite. I have this hanging from the wall of my office at home. I had been lax in following through on doing this “appropriate patriotic exercise” over the years, although, as a 5th grade teacher, I did make sure that my kids learned about, as well as understood, the meaning of American symbols. Still, at whatever school I find myself at, I quickly find myself as the resident “Pinko” on the staff. For instance, the years up to, and immediately after the Iraq War, had, at my old school, led to a stratification amongst my colleagues, between those who supported the military action, and those of us who questioned it. Naturally, in the early days, somehow disagreeing with a government that legally had to defend our rights to free speech, still, nonetheless, made us, somehow, unpatriotic. Unpatriotic. Yup. Even though one of my signature lessons was my annual look at the historical basis for Longfellow’s Midnight Ride of Paul of Revere. I guess teaching about William Dawes makes one hate America. But in trying something new this year, I pledged to pledge. But first, before we did anything, I told myself that I would, at least, give them some historical background on the POA’s history. At least the idea was that my students would then realize what it was they were doing and why. How this manifested in their own patriotic feelings going forward was up to them. It was instructive for myself, as well, as I learned about things I didn’t even realize about the pledge…like this. Thinking back upon my own nascent upbringing as a young American, I doubt that my own grade school teachers intended to teach patriotic lessons designed to turn their kids into raging liberals, but in understanding the history and meaning behind American symbols, they somehow allowed me to internalize the understanding that the phrase “more perfect” in the Constitution’s Preamble meant that America was, and needed to always be, a work in progress. In many respects, my decision to finally become a teacher was part of long process where I, at last, understood that my love for my own country was birthed in a public school classroom by teachers who took the time to explain what it truly meant to be an American. America’s great progress for me, then, was to try to replicate the same sort of patriotic instruction that I had received. As an aside, however, it’s worth noting, even in passing, that the past several weeks of debate, involving possible American military involvement in the Syrian Civil War, certainly gives one the clear understanding of what such progress has come to mean. Still, my goal was to put the background information about the POA out there for my kids, as unfettered and unbiased as I could, explaining the do’s and don’ts of respect for the process, and the expectations I had for them during the morning recital (i.e., hands over the proper side of the chest, hats off, etc…). How they developed their American citizenship over the course of the upcoming school year will be entirely upon them. But we did cover Jackie Robinson in class yesterday, and next week, we begin studying the Native Americans. If nothing else, the latter subject has got to be understood as more than just the only misfire in Schoolhouse Rock‘s repertoire, “Elbow Room”. For now, however, my students have engaged in their appropriate patriotic exercise this week. Trust me, there are other ways it likely gets fractured as well. We will be working on that. I am old enough to remember how “Duck-and-Cover” was supposed to protect my elementary school classmates and I from a Soviet nuclear attack. …because every few months, my daughter’s school, like others across the country, conducts a “lockdown” drill to prepare for a school shooting. A coded message comes over the loudspeaker indicating that there’s an intruder, most likely armed and dangerous, in the building. My job as a teacher, now familiar to many Americans thanks to the procedures rehearsed and followed by the heroic educators at Sandy Hook Elementary School, is to rush the door, lock it, turn off the lights (to create the illusion of an empty classroom) and corral my students into a corner. There, out of sight, we practice huddling quietly as we would if an armed intruder were trying to shoot us through a doorway or window. This past Wednesday, as it was apparently at other elementary schools in the local area, including my own daughter’s school, it was “Lockdown” day. On Tuesday, my grade level team met for the first time since the Newtown shootings. Lockdown procedures, rather than our IB curriculum, become the topic of concern. As often happens with epic-level disasters or circumstances, they only become a topic of importance after they happen, rather than before. As a new teacher at this school, I am admittedly unfamiliar with the procedures, and I need help in learning what’s appropriate at this school site. At my old school, with its stand-alone classroom, my choices were self-explanatory with respect to a Lockdown. (Of course, my final 2 years there were spent in a trailer that could have been at home after Hurricane Katrina. Given its thin walls, and its isolated position on the outskirts of the campus, I could see little protection that it might have provided my students.) But at my new school, with its remants of 1970s pod design, the classrooms open up to a central community area, and the school is split between the upper and primary grade areas, as well as a pod for the administration and the kindergarteners. We are effectively cut off from each other in the event of some sort of emergency. Still, she is worried about the ability to see into her classroom during a lockdown, even with the lights turned off. At my team meeting the day before, I expressed the same worry, as my teammates and I discussed the timeline of the Newtown shootings, wondering if the various offices and storage rooms scattered along the periphery of the classroom pods were accessible to us with our keys, and therefore could be locked. Reflecting up on how students, teachers, and staff, were able to find hiding places at Sandy Hook Elementary in such smaller rooms, we reach a grade level agreement to move our kids into the storage rooms and offices in the event of a lockdown. I bring up the idea that we need to “buy” time in the event of such a situation, that the longer it would take for students to be “found”, the better chance local law enforcement would have to get to the school to intervene. My colleagues’ keys work the doors to the storage room which sits between them. Later on, I am reassured to find that my key will open the RSP room immediately next to my classroom. Unfortunately, we are only 3 classrooms of 75 students, as well as ourselves, there is still a need to find such an evacuation spot for the SDC class, 2 4th grade classrooms, and 3 6th grades. Given that this lockdown is meant to find out how we stand with respect to emergency procedures though, we set aside our initial concerns about trying to find places for everyone, until we know it works for our own classroom of kids. So on Wednesday morning, before my students arrive, I spend a few moments with my 4th grade colleagues, who have the rooms closest to me, to find out what they’re planning on doing. Both pretty much agree that there’s little they plan on doing beyond “ducking and covering”, because there’s not many places they can move towards. I point out that with the lights out and quiet children, from the outside, the temporary wall between our classrooms does provide some cover when viewed from the outside. K., who has that classroom closest to the school parking lot, and with 2 windows that can be used to enter the room, realizes there’s a corner where she can move her kids to hide them from anyone looking in. I suggest that later, after we’re done, we try to see if curtains are an option. My 5th grade colleagues both have curtains on their room themselves, while I am using some posters. Still, at this point, I move outside myself, switch off the classoom lights and try to see what it might look like from the outside looking in. There are areas where children sit where enough ambient light, even on an overcast morning, allows someone to see in even with the lights out. I make the decision to have that student move into the far corner during “duck and cover”. Nevertheless, I ask myself if “Duck and Cover” would truly be that effective if a potential shooter choose to enter the school through my door or window. Rather than immediately question that, I decide it best to follow directions during this drill, in order to question the choice later on, if necessary. My aide comes in, at this point, and I brief him about the procedures we will follow. When I go to pick up the students, as they try to settle in, I immediately cut off the usual insouciance, in order to explain the lockdown procedures the class will follow when it starts. I move from the known to unknown. Most of these kids have matriculated only through this elementary school, but it being the east side of my school district, rather than the west side, I wonder if these kids even know what a lockdown was. None raise their hands. I find out later that lockdowns have been held in the past, but these kids apparently don’t remember it. My girl from Norwalk, a boy from Bell Gardens and another from Hawaiian Gardens, all raise their hand. The other kids, local area lifers, are still silent. I explain the lockdown and what it usually means. Normally, in the area, it’s because the local sheriff deputies are out searching for a suspect in a local crime. We can still function normally, more or less, in such a situation. But today is more about the events in Connecticut. While I have avoided getting specific about details about Sandy Hook, I do get specific now, not to scare the kids, per se, but to explain to them the “why” of what we will do. I work very hard at trying to remain calm, and my usual casual humor is replaced by a more serious tone. I want this to go well. The principal then comes on over the intercom and reiterates a great deal of what I had already told the kids. I am hoping that the kids will get the message to treat this with some measure of seriousness. When the lockdown finally happens, I actually find my hands shaking as I deliver the instruction to get under the desks, and I head over and turn out the lights. So far so good, but slowly, order starts to break down. One kids bangs his head accidentally on one of the desk legs. Others giggle, as they are wont to do during earthquake drills, without heeding my request for as much quiet as they can muster. I strive to do my best to not raise my voice as move to the next step, getting the kids into the RSP office. I try to walk around the room in those areas where it is darkest, and I ask the kids to start to crawl, in the dark into the RSP room. Still, several of my students are determined that they have to provide a vocal soundtrack to the drill. My kids move quickly enough to crawl into the RSP office, and I make a mental note about a couple of my students who backed out into the area of the room still lit from outside light, to remind them to move forward under the desk to crawl rather than backwards. But my aide is getting frustrated as he positions himself at the RSP office door to help guide the student inside. Unlike myself, he is naturally softspoken, but I can see him getting frustrated by the increasing noise level coming out of the RSP office. My goal was try to hide the kids in the office, but with their inability to pipe down, they’ve done nothing but make themselves even more conspicuous. It is all I can do to not throw propriety to the wind and not yell at them to shut up. At this point, the principal, moving through our building to check on statuses, comes by and quietly tries to hush the kids’ giggling and talking. He leaves, my aide and I are dumbfounded when the talking and laughing continue, especially when I see one boy light up his watch because he has to see what the time was. During these drills, my students are often visibly anxious because they’re afraid of guns and don’t and can’t know if the exercise is just a precaution. We behave as if the alarm were real because it could be real, and so we can become accustomed to remaining calm during a crisis. My students hug one another and exchange nervous glances as we crouch on the floor and I silently mouth words of comfort. Someone begins to whisper until another student hisses, “Shhhhhh,” so any gunman wouldn’t be able to hear us. Our principal goes around checking doors in the eerily quiet hallways to see if teachers have followed protocol, and when he jiggles our doorknob, several students start as if in a horror movie. My students, for their part, are far from anxious, because there are enough who couldn’t process what “quietly” even means. When the lockdown is over, the kids head back to their desks. I should debrief, but at this point, I’m looking for seriously methaphorical blood. I ask T. why he was looking at his watch. He replies that he needed to know what time it was, clueless that he belongs to me until 2:15 pm anyway. I ask D. why he thought the whole procedure was so funny. All he can do is shrug his shoulders. I am frustrated. My principal enters shortly afterwards and starts to ream the students out himself. He is not happy. I can see this stuff rolling downhill to me and I want to get out of the way, but can’t. He makes it a point that not only could he hear my students from outside, he could tell where they were based on the amount of noise they were making. “Perfect practice makes perfect execution”, he leaves them. I ream them again, because they’ve gotten reamed by the principal. Later, as we debrief the fiasco in the RSP office, my colleague rustles my jimmies by suggesting it was a classroom management issue. I consider, for a moment, ritual suicide to save face. I find my principal, who’s resumed his normal rounds, and apologize for my class’ behavior. Inappropriate humor or not, I volunteer that my kids and I would be willing to distract a shooter in real life. But still, with tensions being as it was, I don’t relish the idea that 1/3 of my students don’t fully comprehend the criticality of making themselves as inconspicuous as they possibly can, which includes putting a muzzle on their insatiable need to conduct a running commentary during a drill that’s meant to be done in near-total silence. When the kids return from their enrichment classes, I try to tear a new one out of what’s left of them for having been called out by another teacher. But I stop myself. I point out the ultimate need for such an exercise. The state has entrusted their safety to well-being to me, and my responsibility is to keep them in a safe setting to the fullest extent that I can. And when they choose not to follow instructions, they put not just themselves at risk, but also their classmates, and the rest of the school. I point out what I had shared with my grade level team the previous day, that the point of the drill was to see how long we could last in silent hiding. Sadly, that’s not what had gone down. I then praise one of my boys, who is normally chatty, distracted, and moving constantly throughout the room, as probably the one kid who “got it”. L. tells me that he treated the exercise like a game of “Soldier” (I call it “Army Guy”, but most boys seem to gravitate to it at some point in childhood), and that he wanted to be as quiet as he could, just as if he had been playing that game. I remark that the kids might have done better during the drill had they decided to treat it as they might a game of hide-and-seek. But then, I back off, and reassure them that I can better keep them safe if they understand that in any emergency situation, since as fifth graders, they should start to know better by now, to listen absolutely to my instructions. They owe that to themselves, as well as their parents. I tell them that they have to trust in me just like my daughter Kate has to trust in her kindergarten teacher, or the kids and parents in the classroom of V.’s mom (who teaches in Long Beach USD) have to trust in her. Then, I move on to what was left of my instructional time, hoping that today’s morning lesson, while painful, would sink in. After the lockdown drills are over, I try to reassure my students that their classrooms are unlikely to be overtaken by armed attackers. I do a short lesson on probability and the very remote chance that any of them will ever be involved in such an incident. That evening, I arrive on Kate’s campus to pick her up. Unlike my school, which is surrounded by a chain link fence around all the buildings, her district’s schools are wide open around the classroom. It is not unlike the way in which schools were in the 1960s and 1970s when I was growing up in that same area when I was in elementary school. I wonder what could happen on such a campus. As we walk out, I ask her about her day. She volunteers that they had a lockdown drill at school. Then, perfectly, Kates recites, in her remarkable ability to mimic what she hears, exactly what her lockdown instructions had been from her teacher. Even my kindergartner had been better at a Lockdown drill than I had been. Yesterday’s little concert by our school’s Glee Club was ostensibly themed around songs with the word “America” in them, sung by members of our school’s very heterogeneous student body. This is a student body that looks like America does today, even if that thought somehow threatens the cultural comfort of those who’ve become threatened by this “hazier shading” of America, especially in light of all that is going down across the country over the last month. While the “legally justified” murder of Trayvon Martin down in Florida occurred first in the timeline, it seems as it has become a final, ugly manifestation of the more underlying issues that appear to be corroding our society’s bonds of appropriate behavior. And it’s not the only one. Since the boy’s death at the end of February, March has seen less deadly, but nonetheless ridiculous behavior by people apparently threatened by other people of color. 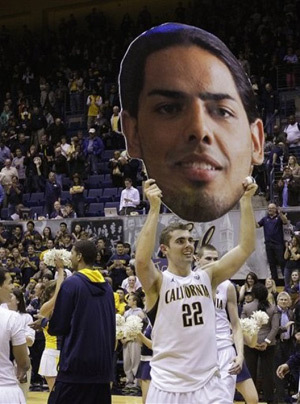 Cal's Harper Kamp, holding an image of teammate Jorge Gutierrez aloft at a game at Haas Pavilion last month. Gutierrez, the Pac-12's Player-of-the-Year, came to the United States illegally at 15, but currently attends Cal on a student visa. Then there is my own Golden Bears, the Cal basketball team, led by its guard and Pac-12 Player-of-the-Year Jorge Gutierrez, whose own story is easy fodder for members of either of the above groups to exploit . By losing its play-in game last week to South Florida before the opening round of the NCAA tournament, I am actually somewhat relieved that we were spared further embarrassment by one school’s fan base taunting yet another a basketball player on their opponent’s side for their perceived immigration status. Even at this stage in this country’s history, the level of simple ignorance about race relations is stunning to me. Raised in the Orange County of the late 1960s-early 1970s, my experience growing up was eventful by being uneventful. My friends growing up were a mixture not unlike a war movie in terms of racial inclusiveness. I was also helped by a mother who would remind my sister and I that being born in America made just as American as anyone else. And as we’ve become even more multicultural, I can look around my classroom at any point during my day and see the polyglot mixture that California has been, and will continue, to become. Which brings us to Langston Hughes and his poem, “I Too”. 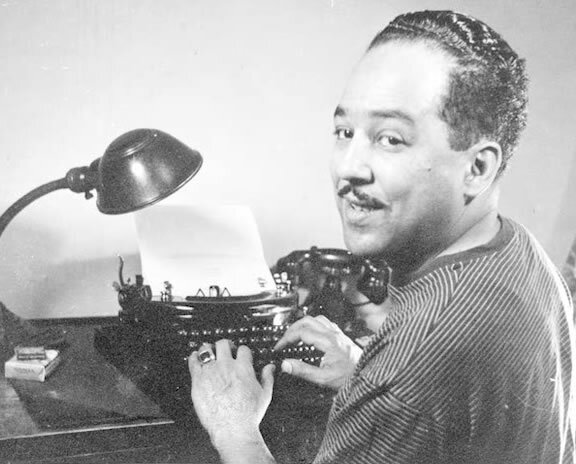 While the school’s Glee Club was learning to sing their songs about America, I’ve been trying to get my 6th graders to understand how Langston Hughes might sing it. These past couple of years, I have used Hughes’ poem in my classroom as a way to teach Response to Literature; more specifically, I am showing my students how to write Literary Analysis using poetry. I struck upon the idea of using Jackie Robinson’s biography as a way of introducing the larger concepts of the Civil Rights era: not as something that emerged along with Martin Luther King, but as a wholly organic movement that predates Dr. King, and Robinson, and whose emotional awakening is found in sentiments expressed by Hughes in “I, Too”, written in 1920s, and likely intended as a wake-up call for brethren of color. …he’s telling us that just because he is a darker color, he isn’t different from us. He also says that nothing can hold him down and that he wants to be free of discrimination. The speaker uses the symbol of integration and segregation. The table is where only whites were allowed…when the blacks have to be in the kitchen to eat while whites are at the table, it’s segregation. They have to be separated from each other. But in the end he is saying that they shouldn’t be separate, he could go sit with them because [African-Americans} have their own rights. [Hughes talks] about how black people were treated, and how [this] treatment changed over time. In this poem, Langston is explaining how he gets treated differently because he is “the darker brother”. Langston shows how back then “darker” people weren’t really welcome to eat together [with whites] “when company comes”. He tries to show how some “darker” people don’t take it to heart. They “laugh and eat well, and grow strong”…what I think he’s trying to show the reader is how “darker” people really couldn’t argue back because white people didn’t care and would just beat them. So then, I think Langston tries to show by saying “Tomorrow”, he was saying in the future and how things would change and they’ll be at the table. In American, the [poem} is about how black people are not treated right. He is saying that he has the right to do anything and do what whites can do too. Like in the [poem] he said, “They send me to eat in the kitchen, when company comes but I laugh, eat well, and grow strong. He is trying to say that he is tough to stand up to them, that he does need to listen to them [and] what they say. When it says “I am the darker brother”, it says that he’s being judged or discriminated by his skin color, by his culture. When Langston says “Tomorrow, I’ll be at the table when company comes. Nobody’ll dare say to me, ‘Eat in the kitchen’. “Then” he menand that, he knows he will sit at the table with everyone else, he won’t be sent to the kitchen ever again just because he has a different skin color. He says, “besides, they’ll see how beautiful I am, and be ashamed”, meaning that they will be ashamed of how bad they have treated him. And how rude it was to send him to the kitchen, just because of a different skin color. They will be ashamed. I think what the poem is trying to say is that every[body] is a part of America. It is also trying to say that everybody is the same; we should be treated equally. Like Jackie Robinson, we should all be able to play the same sports, eat in the same place, drink from the same water fountain, and go to the same school. Imagine yourself in the [speaker’s] shoes. If I were him, I would think that I have the rights to do what I want to. When it says, “They’ll see how beautiful I am”, I think that it’s saying [that] beauty is not just from the outside but the inside as well. Also when the poet wrote, “Nobody’ll dare say to me, ‘Eat in the kitchen, then.’. I think that he doesn’t want to accept the way things were. And when he says “tomorrow”, it means that soon the way life was at that time would change. I believe he wants to stop racism so everyone can be treated equally. So he thinks in the future there is no more discrimination against colored people. His dream came true, there is no more discrimination against colored people. One would think so, right? Watching news these past few weeks, you get the sense that there is some unconscious need to lock that metaphorical kitchen door. But youngsters like those who are in my classroom every day are the ones who attitudes are, I hope, the attitudes that will prevail. My students, along with the ones singing about America yesterday afternoon, ARE the company that’s coming. It’s time to get out of the kitchen.